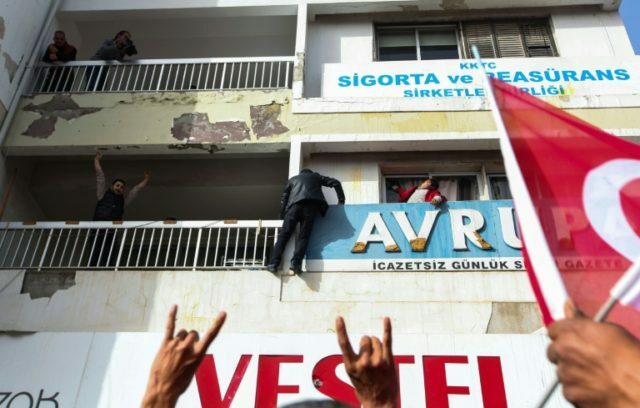 Nicosia (AFP) – Hundreds of protesters, hurling stones and eggs, demonstrated outside the offices of a Turkish Cypriot newspaper in northern Nicosia after it slammed Ankara’s operation inside Syria as an “occupation”. This was an ironic reference to the 1974 Turkish invasion of northern Cyprus which is regarded in Turkey as a “peace operation” but, in the eyes of the international community, led to Turkish troops occupying the northern third of the island. Around 500 protesters, waving Turkish flags and the flag of the breakaway Turkish Cypriot statelet, gathered outside the offices of the paper, throwing stones, water bottles and eggs which smashed the building’s windows. “Allahu Akbar! (God is Greatest! )”, they shouted. A group climbed a pole and dismantled the newspaper’s main sign. Police refrained from taking action, an AFP journalist reported. At the weekend, Erdogan had personally taken aim at the newspaper, criticising its headline as “immoral”. “They say the Turkish army is carrying out another ‘occupation’ after Cyprus. How immoral it is, how shameless it is!” he seethed. Erdogan also called on the Turkish Cypriots not to remain silent to the newspaper’s controversial headline. The eastern Mediterranean island has been divided since 1974 when Turkish troops invaded the northern third in response to an Athens-inspired coup seeking union between Greece and Cyprus. The Turkish Republic of Northern Cyprus (TRNC) is recognised only by Ankara. Turkey on Saturday launched its operation with Ankara-backed Syrian rebels to root out the Syrian Kurdish Peoples’ Protection Units (YPG) militia from Afrin. Turkey views the YPG militia as “terrorists” linked to the outlawed Kurdistan Workers’ Party, which has fought against the Turkish state since 1984 and is designated as a terror group by Ankara and its Western allies. Erdogan has urged national solidarity over the operation and the government has reached out to leaders of the main nationalist and secular opposition parties. But Erdogan warned those who respond to calls for protests in Turkey will have to pay a “heavy price”. The authorities on Monday detained 24 people on suspicion of disseminating “terror propaganda” on social media.